Sweet 16 party is very special! No longer a child and not yet an adult, sixteen is an exciting time. Your sweet sixteen party can be extremely formal or quite casual. Depending on its size, you may rent a hall or have it at home. It’s really up to you! Whatever you choose to do, just remember that this your special moment. The one you will remember for the rest of your life! You may choose to have a theme for your celebration. This website has a lot of theme ideas that you can use. Below you’ll find some specific tips for planning an outstanding sweet 16 bash. 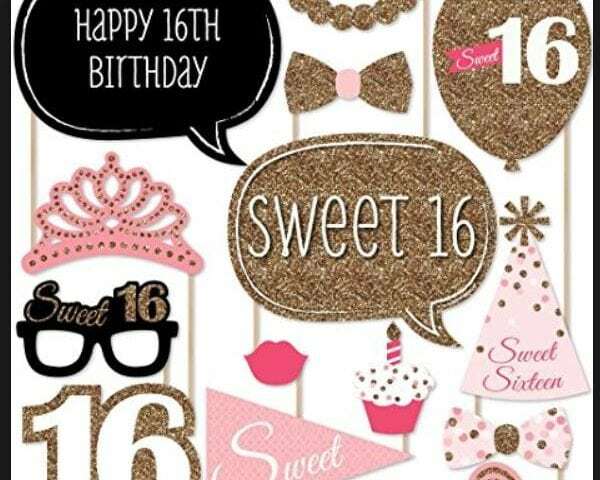 Use invitation cards for sweet 16 party invitations. Print your baby picture and a present-day picture on the front. Then sprinkle some gold and silver glitter on it. Write your party information inside the cards, and attach a golden ribbon at the top. For a different idea, you can make your invitations look like a drivers’ license with a picture, address, Class of (year), height, etc. Remember to include all the party specifics. For a formal party, you can opt for getting your invitations professionally done. Just make sure it fits your budget. Specify whether it’s a formal, semi-formal, or casual party and what the guests should wear. 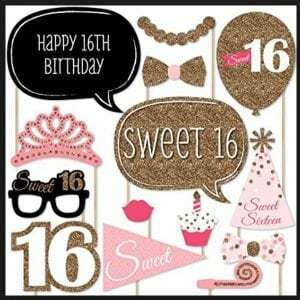 Purple, pink, silver, and gold are great colors for sweet 16 party decorations. Have helium balloons and paper streamers in those colors. Use inexpensive red material for the “red carpet” on your walkway leading to the front door. String clear Christmas lights around the walls. You can have some ribbon streamers hanging from the ceiling. Cover the bottom edges of window sills with fake flowers. Create a large banner that says “Sweet 16”, and tape it on the wall. Get some digital photo frames, and upload important pictures of your life from different ages. Turn the slideshow feature on, so the pictures change automatically. Place the frames on furniture. You can even use these digital frames for centerpieces as well. They are awesome! Rent a fog machine, and place it near the dance floor. Have a chocolate fountain set up in the area. Place a few bowls with fruits that the guests can put chocolate and snack on. Cover your party tables with purple or silver tablecloths. Place vases with flowers, and glasses with floating candles. Scatter confetti on the tables. *Guess How Many? : Place some candy in a clear jar before the party. When the guests arrive get them to guess how many candies are in the jar. The winner gets to take the jar with candy home. *Picture Montage: Officially kick off the party by showing everyone a power-point presentation showing your pictures growing up. Picture frames, bracelets and necklaces, bow ties, mini purses, gift certificates, movie tickets make great sweet 16 party favors. It’s ideal that you have a DJ at the event. Ask your friends if they can recommend anyone. Even though your party will revolve around music and dancing, here are some extra activities you might want to have for a variety. *Poster Signing: Create a poster with pictures from childhood to the present day. Place that poster on the table near the entrance. Each person will sign it with best wishes. This will be a great memento from the party that you will cherish for years to come. *Dance with Dad: To get the party started on the dance floor, ask the DJ to put a slow song. You and your dad will have the first dance. *Don’t Stop the Music: This is the time when the music really starts to pump. Have the DJ mix a few tracks to get the guests into the groove. Remember to tell the DJ beforehand the type of songs and music you’d like to have at your party. *Funky Salsa: Why not try something new? Invite a salsa instructor over, and have her teach a few moves to the party group. Once the participants get a hang of it, put on real salsa tunes, and have everyone give it a try. *Do the Limbo: Have a limbo stick, and have the guests go under it while the music is playing. Lower the stick every time, and see how low can your friends go. *Karaoke: Rent a karaoke machine for those who get tired of dancing. *Sweet Sixteen Movie: You can have a few of your closest friends stay over, and watch some movies such as “Sixteen Candles,” “High School Musical,” and so on. Prepare for worst-case scenarios and how you would handle them. What if your DJ doesn’t show up? What if teenage boys get in a fight? What if someone arrives drunk? and so on. If you plan to have a lot of teenage boys at the party, consider hiring a couple of security guards or ask a few parents to help out. This will help control any rowdy activity. Serve alcohol only to people over the age of 21. Set up a bar where teenagers can have “mock” cocktails, virgin margaritas and other safe drinks. If you plan to have the party at your house, then let your neighbors know. With energized teens around, it’s going to get noisy. So keep your neighbors in the loop, and mostly likely they will look at the situation with understanding. To have a smooth and safe celebration, have some extra adult help. You should have 1 grownup per about 5 guests. *Sweet 16 Cake: 3-Tier cake is the best choice for sweet sixteen birthday. Bake 3 round cakes in slightly different sizes. Frost them in color of your choice. (Pink or white are best.) Decorate with fondant, and stack the cakes on top of each other. Place “16” on top of the cake. Serve your drinks in plastic martini and margarita glasses.